It has been quite a while since I was on a crew team but I was pleased to have the opportunity to get back out on the water when we were home in Ireland. 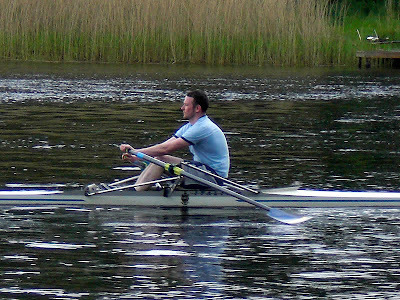 Although I competed in various boat sizes, my main focus was on the single scull (sculling is where each rower has 2 oars rather than just one, as in sweep rowing). 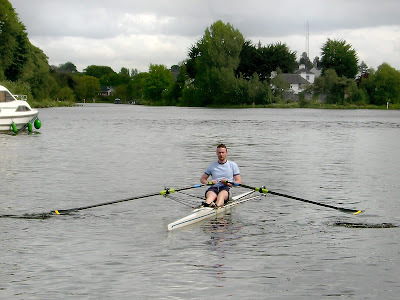 I was a member of Portora Boat Club for five years during high school. Well it seems that rowing a boat is a little like riding a bike. I got back in to the swing of it quite quickly but my balance could use some work. A boat that is narrower than you are doesn't have any stability, but that's what makes it fast. If it weren't such an expensive sport to get equipment for I would love to get back into it.